Swim history before SwimTrek I started swimming at my local club at the age of 8 progressing through the squads and achieved over all county/regional age group champion at the age of 14 and became a national open qualifier by 15. I left my club at the age of 17 due to the pressures of college and working life and didn’t return to the pool until id finished college and settled into a full time job, at this stage I was swimming for pleasure alongside running and rock-climbing. The years rolled on till at 32 I started longing for some direction to training and started looking at open water swimming. I decided to enter the Epic 1 mile swim in Ullswater and managed a respectable 10th in the Male open category, this good result spurred me on and I entered several events over the following years. As some of the events required SASA membership I joined a local club and found myself back in the pool and entering Masters swimming events. 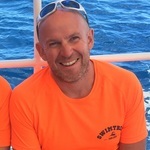 I started coaching swimming in 2013 and now spend a lot of time coaching a local club and progressing my qualifications, I also enjoy sailing with my local yacht club and provide safety boat cover for the Dinghy races with boson responsibilities for the safety RIB. Most memorable swim moment Winning a bet with my swimming coach (he said I could never make the qualifying time) and competing in the Scottish open Swimming championships in 2012. Top swimming tip Technique is key when swimming and even more so when training for distance swims, when you start out try to not be so concerned with pushing out the laps and spend some quality time working on your stroke technique. The biggest improvement I see that people can make is getting the catch position just right, your fingers should be the lowest point of your arm followed by your wrist, elbow then shoulder aim for this at the start of the catch and keep your elbow high throughout the whole stroke. Interesting fact I have a brewery in my garage and grow my own hops.